A story of how well Matt Eskins can fare in the Susie On Tour Challenges. Welcome to my journey on the Susie On Tour challenge. 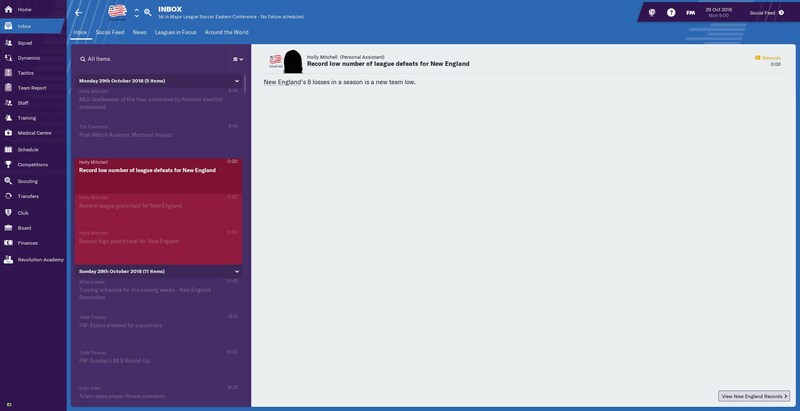 As you know the first stop is in the MLS at New England Revolution and hopefully, I can take them to far heights! 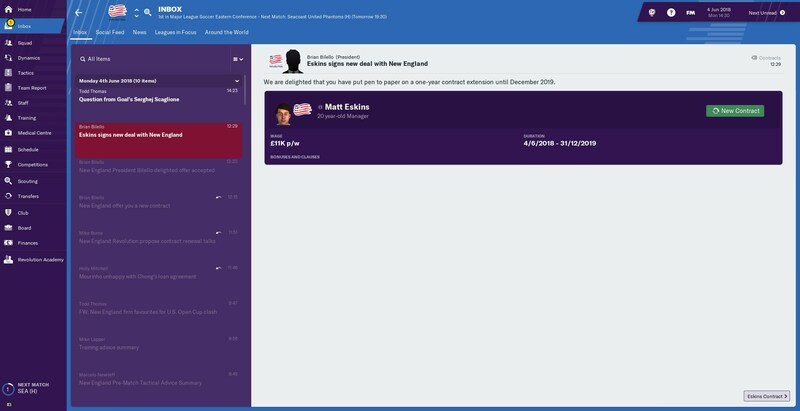 This is my manager Matt Eskins who we are using to take New England to the top and there are also his required coaching badge and playing experience. Great loan deal as we get a great midfielder and he's also American which frees up the international slot for others. 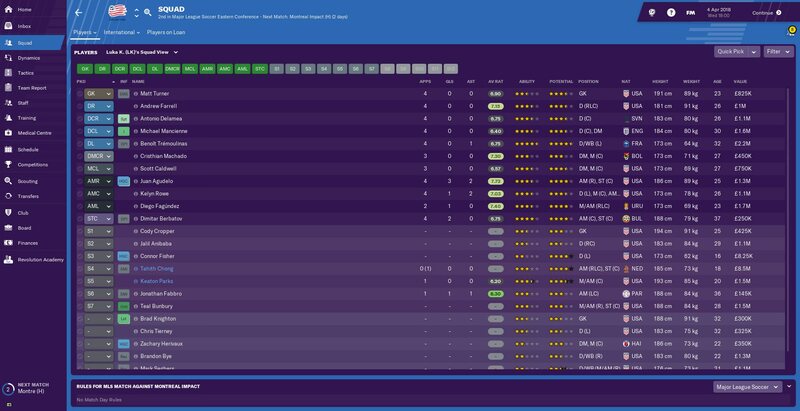 Overall, I am extremely pleased with the transfers as we get rid of some deadweight and get top quality players coming in like Tremoulinas, Berbatov and Parks all for not an inch of a transfer fee. We start off the MLS with a 1-1 draw away against Philadelphia where Berbatov gets a debut goal. 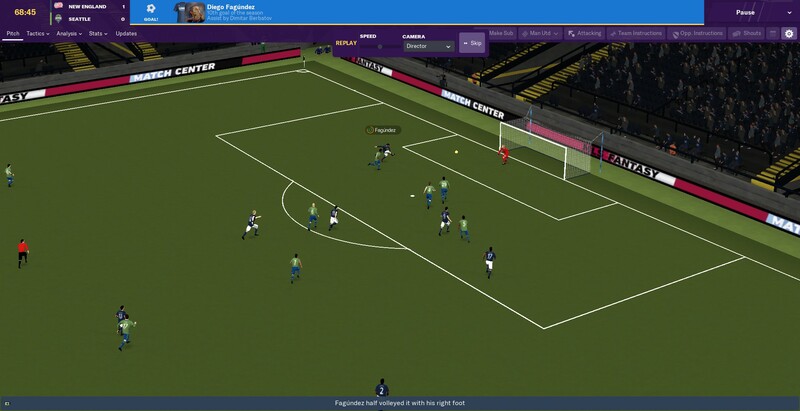 In our 2nd game Agudelo starts to shine as Berbatov seals the winning penalty. Next is an impressive game against New York City as we smash them 4-1 at home. We then end off the month with a disappointing 2-1 loss to Houston where Agudelo gets 3 goals in 3 games in a row. Matt Turner hasn't done anything special in goal but there really is nothing to expect of him considering he isn't that good. Farrell has been the only one who's playing good in our back 4 as Delamea and Mancienne have been below par. I would've expected more from Tremoulinas so far but there is plenty of time for him to show his quality and he's already got an assist to his name. Machado has been an important player in CDM and the only game we've lost has been without him in our side while Caldwell hasn't done anything special in CM. 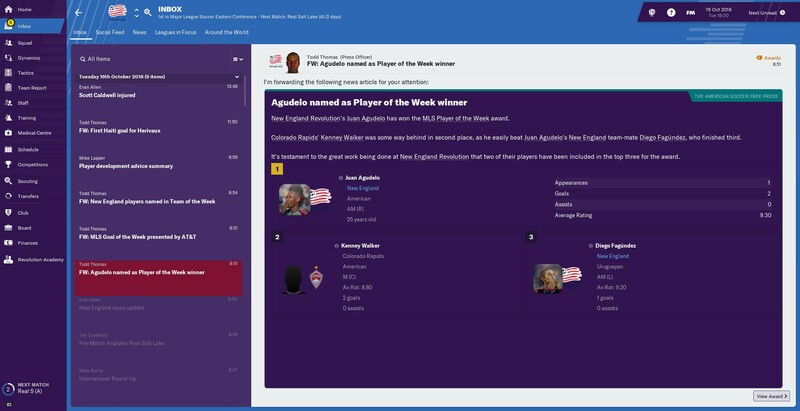 Now to our star-studded attack, Agudelo has been our best performing player as he has got 3 goals and 2 assists while Rowe and Fagundez have been doing well. Berbatov up top did well at the start but is dropping off but hopefully, with some tweaking, he can get to top class form. 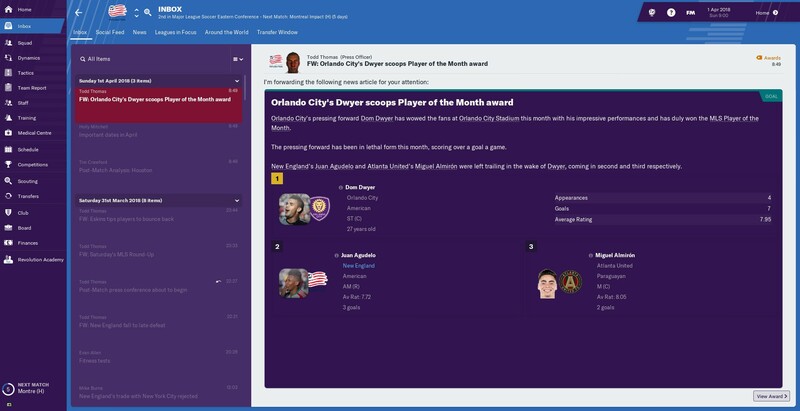 Agudelo makes 2nd place in player of the month very deservedly. 5 players make the team of the week in an impressive week. Rowe claims 2nd place in player of the week. We started off the month with two impressive home wins. We play Montreal Impact where Berbatov scores another penalty and Fagundez plays well. Next up is the match of the month as we defeat Dallas 4-1 as Agudelo gets ANOTHER 2 goals and Keaton Parks, our loanee, starts to impress with 2 goals. We continue our winless away form as we lose a 1-0 lead in a 1-1 draw against Columbus Crew in Agudelo's 6th goal this season. 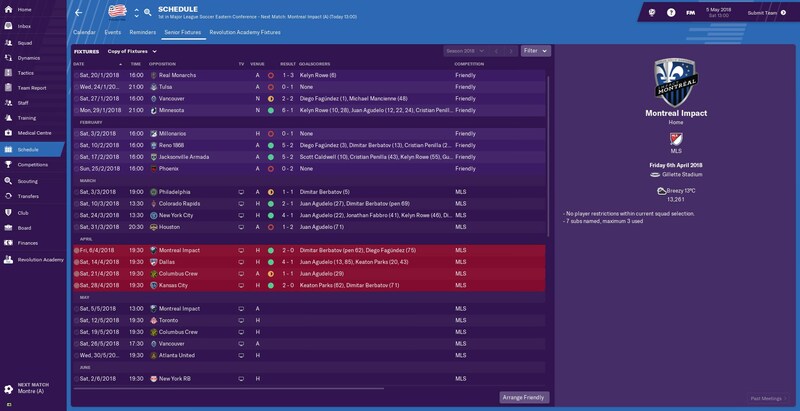 We end of the month nicely with a 2-0 win as Keaton Parks gets another goal which is very good and Berbatov may be back to form as he adds another to his tally. 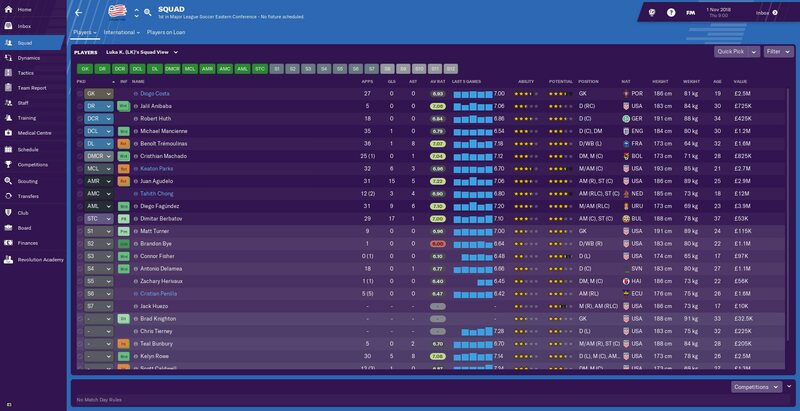 We got a long month ahead as we have Montreal Impact AGAIN at the start of the month AGAIN (typical FM scheduling), then Toronto which should prove to be difficult then Columbus Crew AGAIN followed by Vancouver and then 2nd place Atlanta United. 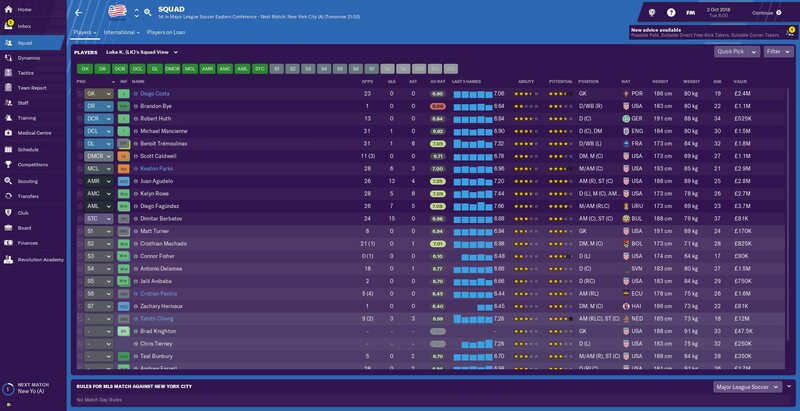 Matt Turner had a decent month as he claimed 2 clean sheets but I FINALLY managed to bring in a quality goalie near deadline day. 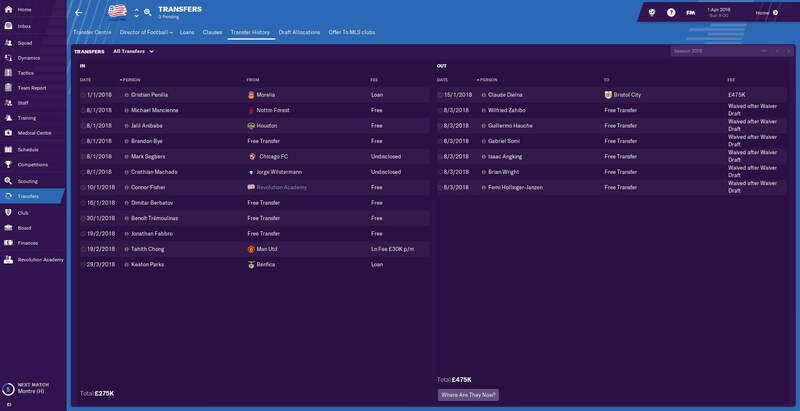 As you can see in the photo above, we got Diogo Costa (not related to Diego) on loan from FC Porto who is 1 whole star higher than Turner in quality and I'm very excited to have him on board now as well as Parks. Farrell continues his good form as Mancienne and Delamea got better this month while Tremoulinas adds another assist to his statistics this season. Moving onto midfield which is held by the consistently good Machado, we got the Pogba-esque centre-mid in Parks who has got 3 goals and 1 assist in 5 games. Agudelo continues to show his quality as Fagundez is also impressing while Rowe is still doing well. We're limited up top with only Berbatov and Bunbury, but Agudelo can also play there if needed. Berbatov looks like he's on the verge of getting around one goal every two games as he has done this month and 4 goals in 6 games for a strikers isn't that bad. Parks here claims player of the week deservedly as Agudelo clinches the top 2. Keaton Parks makes the top 3 twice with two great goals but just can't make that top 1 for the week. Our standout players Agudelo and Parks make team of the week. 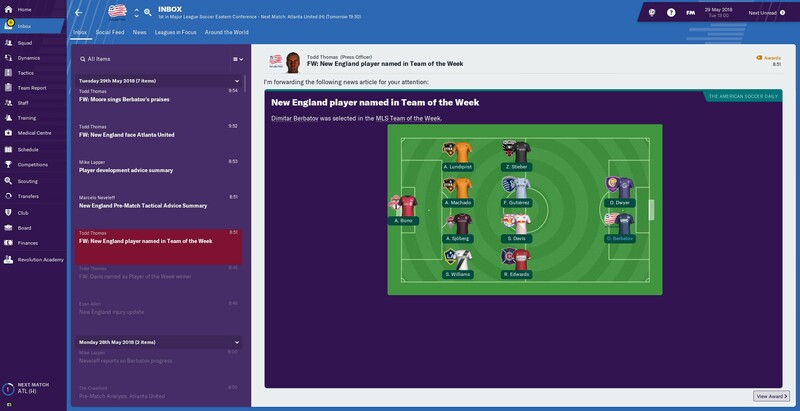 Tremoulinas is also in another team of the week. We're now on top of the table for the Eastern Conference AND MLS Supporters' Shield . 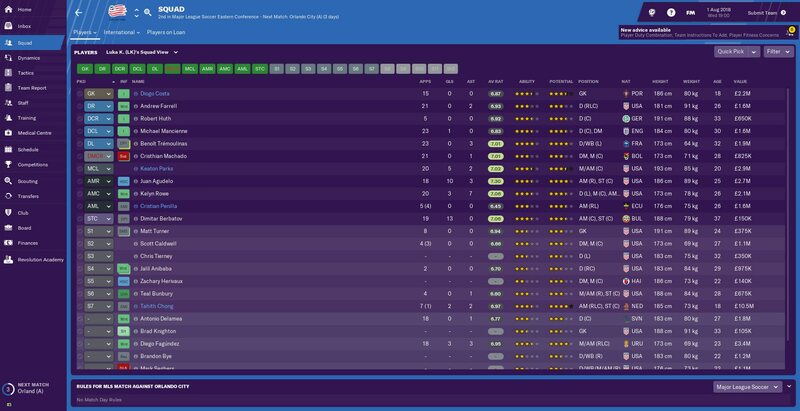 In terms of player stats, there isn't much noticeable from us apart from the fact that Agudelo is 3rd in average rating which is pretty fair in my opinion considering how vital he has been to us. 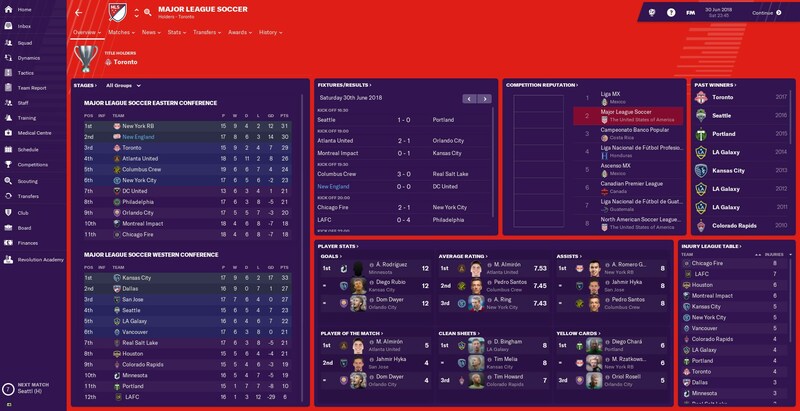 In already May, we start off the month with our first away win of the season against Montreal Impact which I am happy with and continue that form into our 2-0 win over Toronto where Berbatov gets a double. 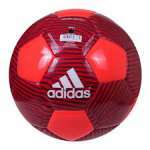 What followed that was an unspectacular match against Columbus Crew who we drew with away from home as we lose 1-0. We bounce back with an encouraging 4-1 win versus Vancouver as Berbatov gets a hat-trick of penalties. We finish off the month with a well-fought 1-1 draw against Atlanta United who is the toughest team in my opinion that's in the MLS. Berbatov is the only player to make the team of the week. Berbatov makes runner-up in the player of the week after he also got included in the team of the week. Tremoulinas and Berbatov make the team of the week. Dimitar Berbatov's goalscoring antics earned him 3rd place in the goal of the week. 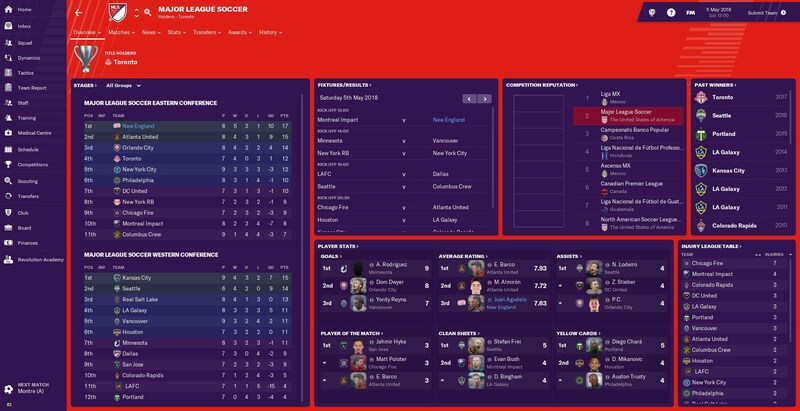 Once again we're on top of the table, but this time Toronto are battling for 2nd place so they can get automatic qualification for the MLS play-offs. I don't even know where to start as we had an absolute garbage month, although there is a pretty good explanation for it. Starting off the month against rivals New York Red Bulls, where Thierry Henry played a few years ago, we lost 2-1. If I'm honest, we were horrible in that game and got outplayed but a stoppage-time goal made the game look tight judging by the scoreline. We then had the easiest match of the month in the US Open Cup 3rd round against minors Seacoast United Phantoms which was our only win of the month when we recorded a 2-0 win at home. To continue our bad away form, we drew against rivals Chicago Fire 1-1 which turned out to be the same scoreline at San Jose, also away from home. 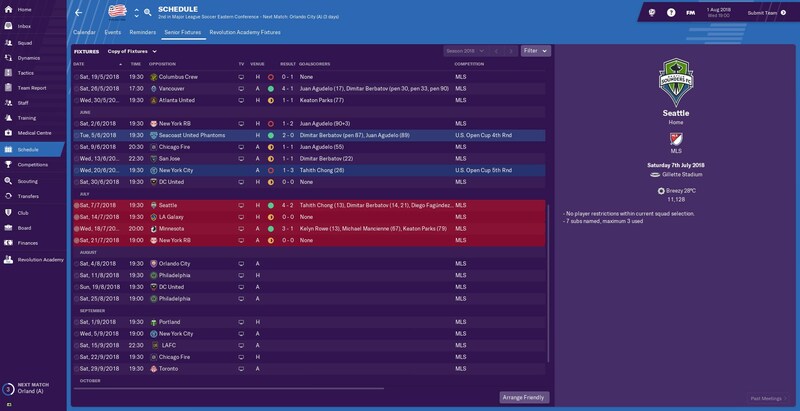 As much as I would've loved a cup run, it ended pretty early as we fell to a 3-1 defeat against New York City in the 4th round of the US Open Cup. To end off our poor month, we draw AGAIN against another one of our rivals, DC United in a goalless match. 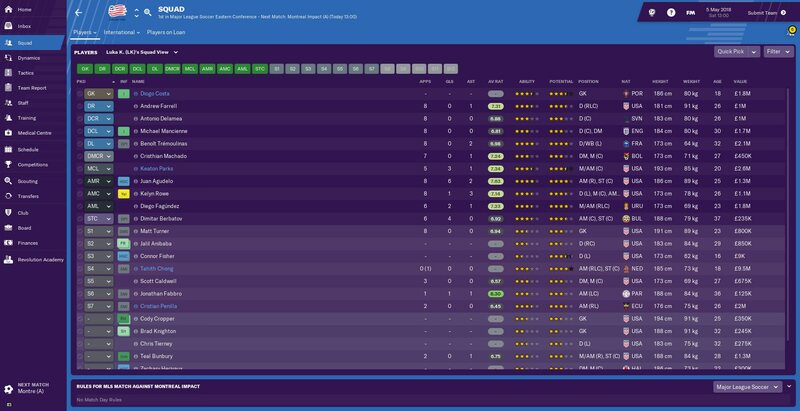 Following the horrible month, everyone's rating in the squad dropped down as we only have three players in the squad with a green rating. Star players Tremoulinas and Berbatov are the only one to make it into any sort of awards in this atrocious month as they make the team of the week. 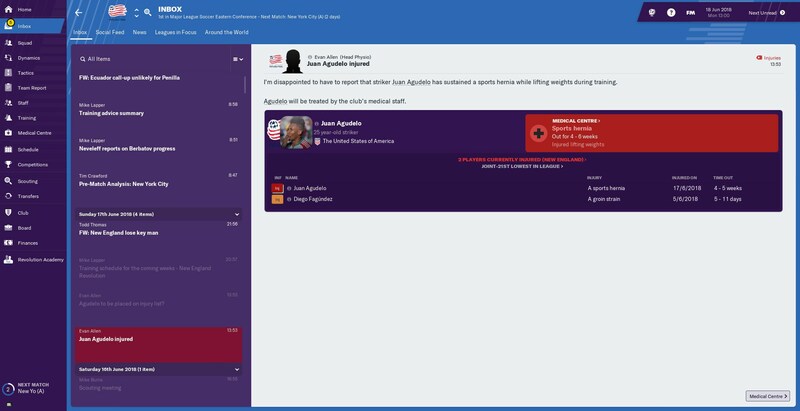 Here is the reason why our form has majorly dropped off, our star player Agudelo suffered an injury that pretty much ruled him out for the month as he suffered as sports hernia, this is very detrimental to our progress. 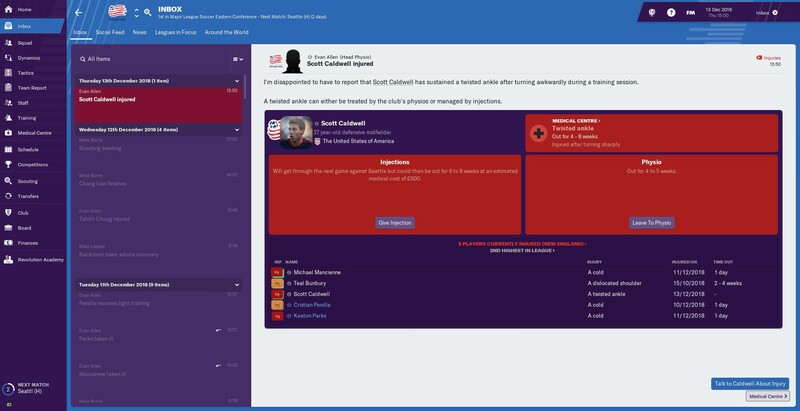 On the bright side, my manager got offered a new contract to 2019, but as you know we won't be staying that long. We're finally starting to improve as we've only experienced 1 loss in the last 10 matches. Although that seems like an impressive feat, you've got to take in the fact that half of the matches have been draws, unfortunately. This month, we start off with a 4-2 win against Seattle which is followed by a 0-0 draw against LA Galaxy. To end off the month, we play 2 away games, one of them versus Minnesota whom we beat 3-1 and the other being a 0-0 draw with New York Red Bulls where draws seem to be a common occurrence against rivals and strong teams. 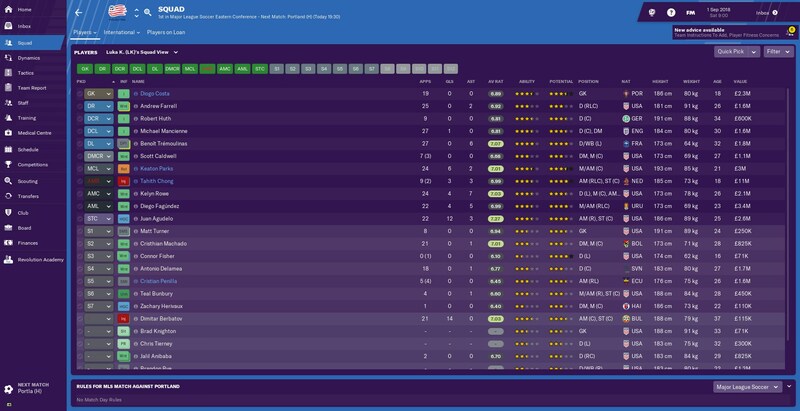 A big improvement as quite a few more players are in the green now in terms of rating, but it would be nice if we could keep clean sheets in games where we score goals. In most of the awards, Chong and Berbatov are the pick of the pack after a successful month. I've been lucky enough to be chosen to manage the MLS All-Starts team on the 1st August vs Bournemouth! We still occupy 2nd place, but we're only 3 points off rivals New York Red Bulls while we're 5 points off Toronto as Atlanta are 2 points behind, but we have 2 games in hand against them. At this stage, I'm pleased and am optimistic about how well August is going to be. Quite an impressive month here, starting off with a solid 1-0 win away from home against Orlando City which was followed by a scaring 2-1 win over Philadelphia we're they got a goal to get back in the game at 2-1. We then play DC United and you can only guess what happened against one of our rivals... ANOTHER DRAW!!! It was 1-0 to us thanks to a Chong goal but then they pulled one back late in the game. To end off the month nicely, we record a 3-1 win against Philadelphia who we've played for the third time this season. 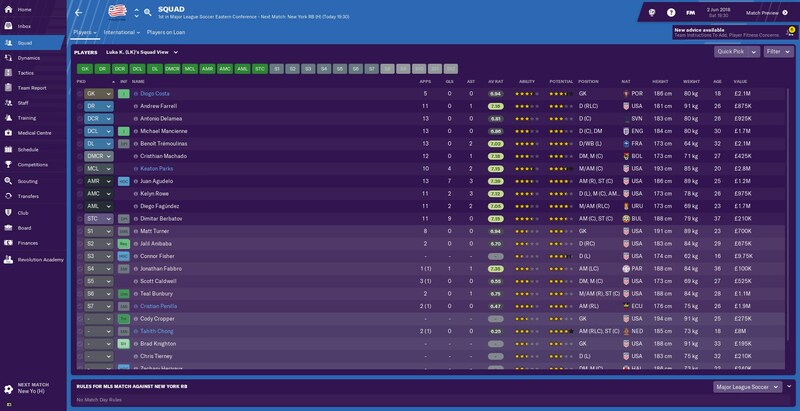 Goalie and defence haven't been too great but Tremoulinas is really proving his quality when it comes to attacking as he's had a handful involvement in goals while in midfield we got Machado holding the defence in CDM and Parks really creating our chances and even scoring quite a few! In attack, Chong is starting to pick up some form while Agudelo is Agudelo and Rowe is quite good but Fagundez hasn't been the greatest but he's picking up form now. Diogo Costa makes the team of the week while the amazing Tremoulinas makes it twice. Over the course of the month, we have had to deal with Berbatov's knee injury but we've been able to handle it well. In terms of the MLS All-Stars game, it went extremely above my expectations. Considering the fact we were playing a Premier League team with MLS players, I was expecting to lose, especially considering the fact that I wasn't even playing a natural LB and CB, but to win 4-0 is an amazing feat. Now we sit in a dominating position for the Eastern Conference so this will definitely help us with the points. In terms of stats, we aren't really making the top 3 of anything except for yellow cards which Machado is leading in, but he has been phenomenal this season in helping the defence. Our second last month sees us continue our unbeaten run which got extended to 13 games. We started the month off against Portland Timbers in which Agudelo and Fagundez get the goals. Our unbeaten streak nearly against LAFC, but we got saved by another Dimitar Berbatov penalty. 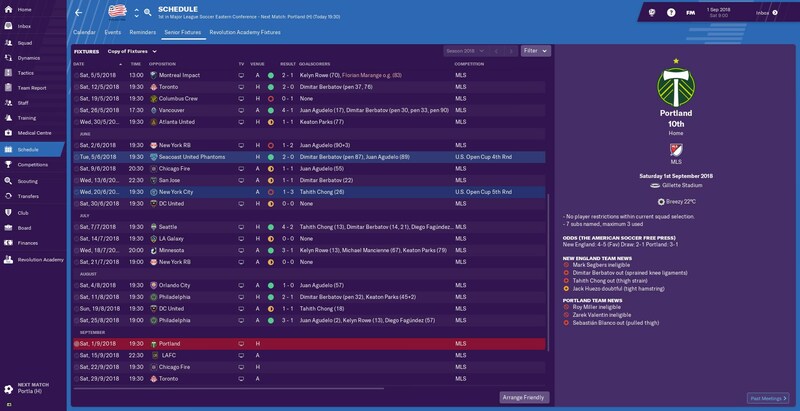 Our first rival win of the season comes against Chicago Fire, whom we smash 3-0, but it comes with an expense as we lose to the strong Toronto FC in a 2-1 loss. This month we got clean sheets in all our games hence why in the last 5 games Diogo Costa is on a 7.06 rating. 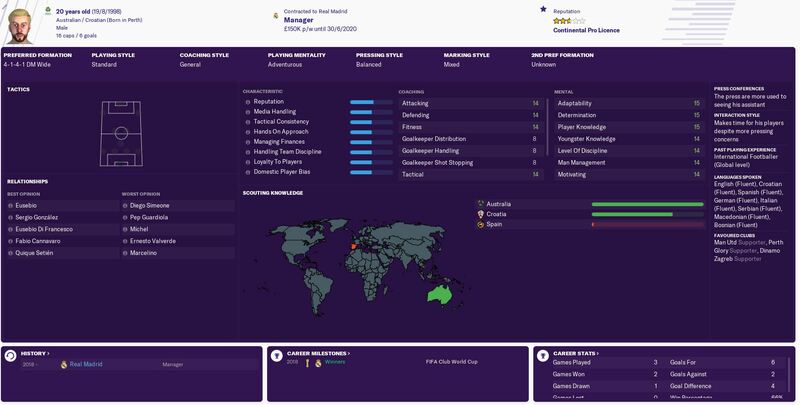 In defence, there is nothing special except for Tremoulinas who's been absolutely phenomenal as he has got a 7.32 rating in the last 5 games which is much higher than his general average rating of 7.05. It hasn't been exactly a great month for our midfielders as they all have ratings below 7 in their last 5 games. In attack, Fagundez has been on fire with a 7.66 rating in the last 5 games. 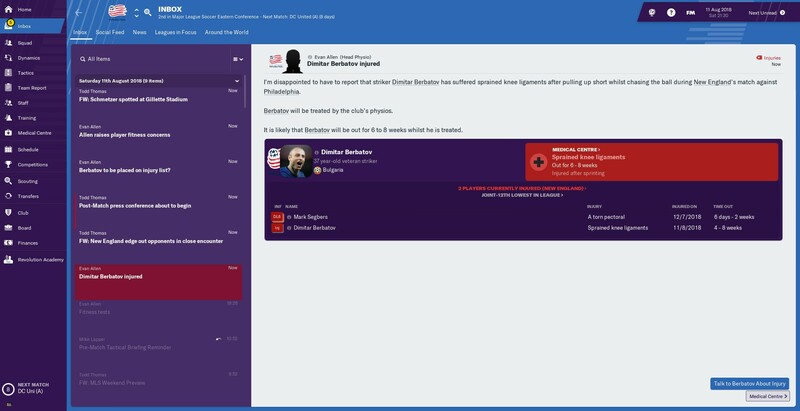 While Chong, Agudelo and Rowe are all having solid games recently, the aging Berbatov has been atrocious with a 6.66 rating in the last 5 games. Plenty of awards this month as Tremoulinas, Rowe and Fagundez all stand out. 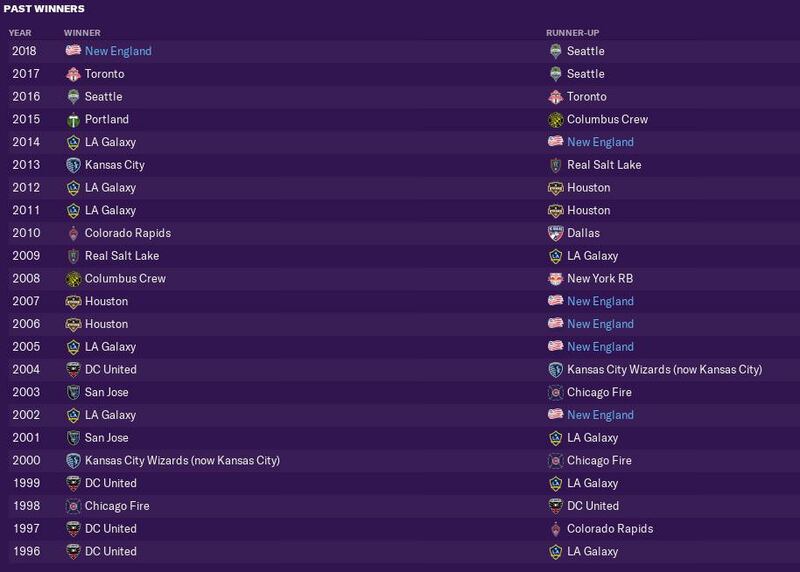 We've now confirmed the playoffs which are already an amazing feat and at this stage, it looks highly likely we're going to finish on top of the Eastern Conference and hopefully Supporters' Shield which we're unfortunately 4 points off Kansas City with a game in hand. Does anyone prefer how I did this post over the old ones? Diogo Costa continues his good form in goal as he bids to claim the goalkeeper of the year award. In defence, Tremoulinas is amazing as usual while Anibaba has played a few good games in Farrell's absence while Huth and Mancienne continue to play unimpressive and unlike a player who was in the Premier League a few years back. This month, Machado has been even greater but Keaton Parks is starting to get tired and could do with a rest soon. Rowe and Agudelo are playing well but not as great as last month while Fagundez is starting to take over the team with impressive performances while Berbatov is starting to get a few more goals. Tremoulinas makes team of the week as he proves once again that he's the best LB in the MLS. In an amazing week with our 4-0 win over Orlando City, Agudelo makes the top 3 for the goal of the week TWICE AND wins player of the week while NINE of our players made the team of the week. In our impressive reign as manager, we've managed to break 3 records this season in the Eastern Conference. 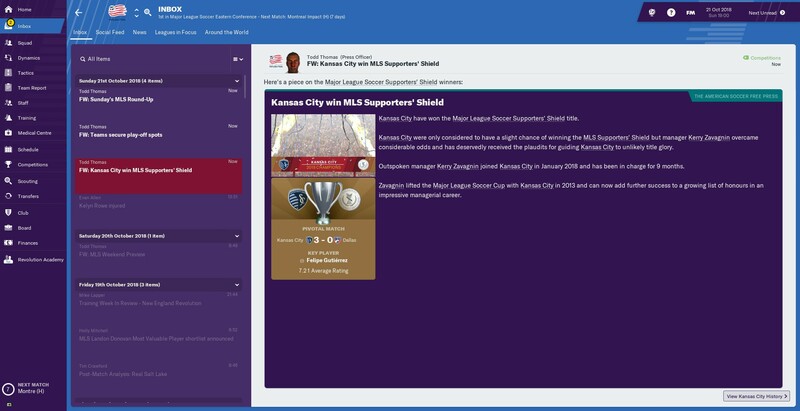 Unfortunately, we couldn't win the Supporters' Shield which is a real bummer, but lets at least appreciate the fact that we exceeded expectations by coming runner's up in the Supporters' Shield where we hampered ourself with an unimpressive October which left us 6 points behind Kansas City. As we finished top of the Eastern Conference, we automatically qualify for the MLS Play-off semi-finals. 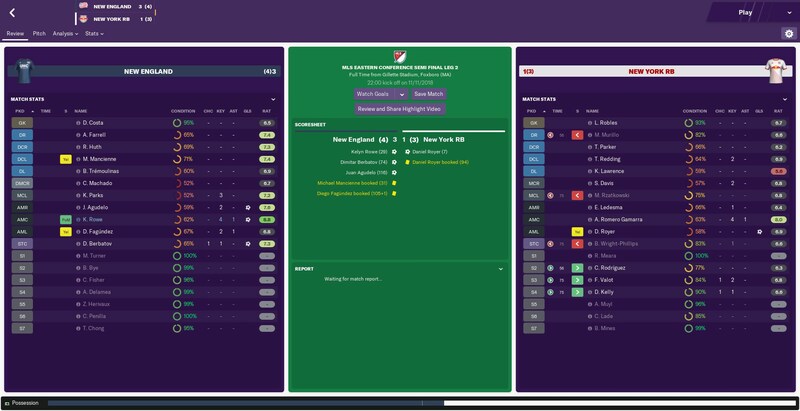 We don't start off good as we not only miss out on a potential extra 5 points from beating New York Red Bulls, but we also go behind on aggregate as they got a stoppage-time goal to make it 2-1 in the first leg leaving us in a shaky position going into the 2nd leg. What a hard-fought performance! 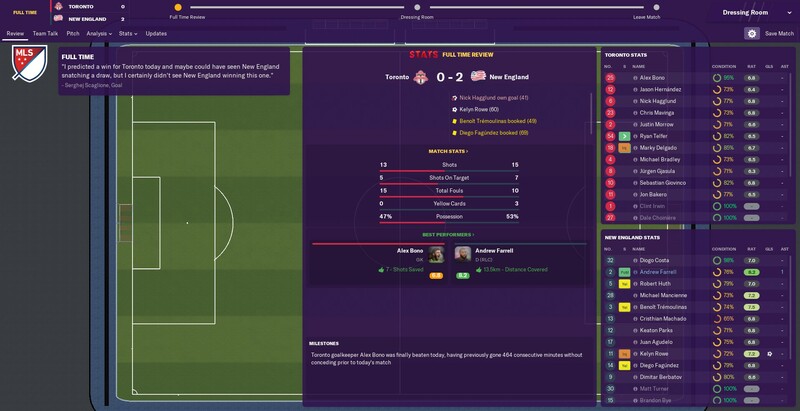 We were winning 2-1 in normal time and the match got taken to extra time as it was even on aggregate and we managed to get another goal as we win 4-3 on aggregate and make our way to the MLS Playoff Finals! AGUDELO IS THE PLAYER OF THE YEAR! A great result for us as we can add another 5 points to the tally! How does everyone get a hyperlink in their bio when they put their story and when u click on it (when it's blue) it goes automatically to the story page. Does anyone know how to do that for the signature? 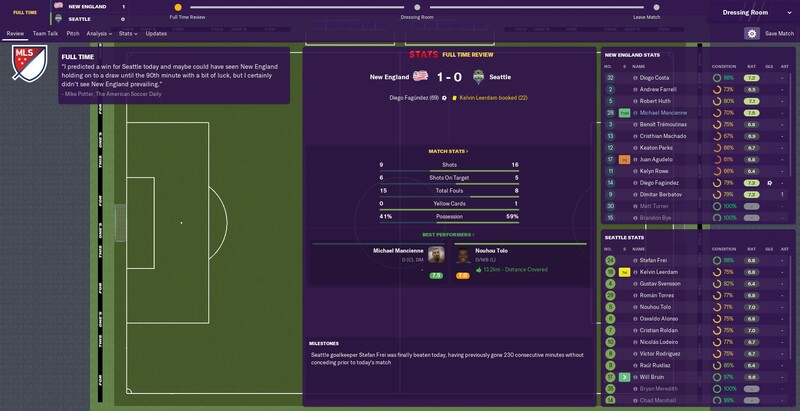 We started off the MLS Playoff Final against Toronto, who pretty much has been our Achilles heel for most of the season, but surprisingly we managed to grab a 2-0 win away from home. 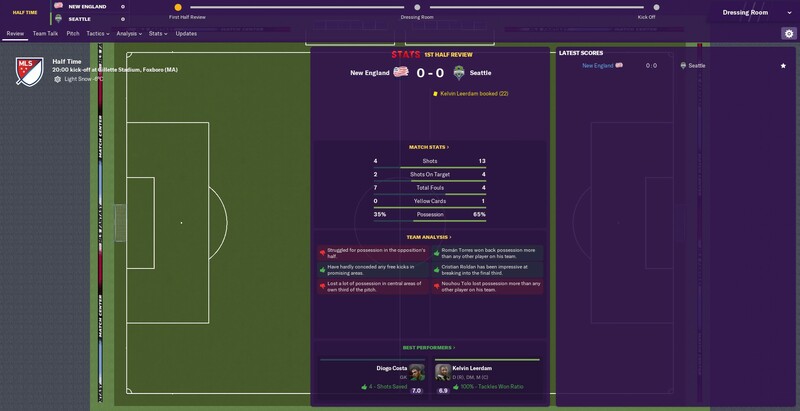 We got off to a lucky start as one of their players conceded an own goal just before half-time which put us in a good 1-0 position. 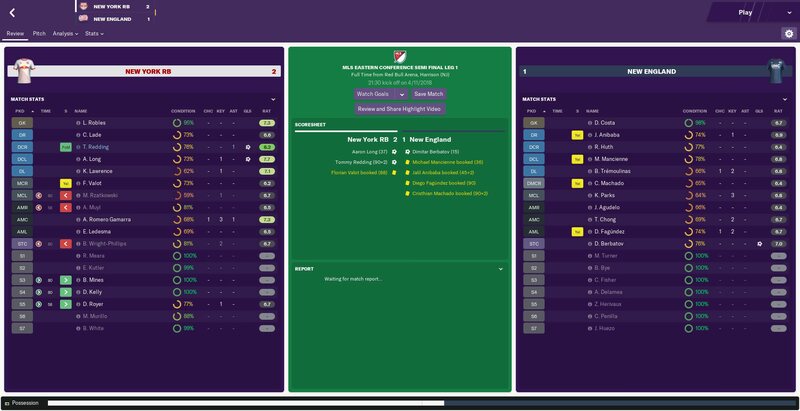 We then cemented a good aggregate lead as Rowe got a goal on the hour mark to make it 2-0 which meant we've also got two away goals to help for the final leg at home. In the 2nd leg, we were marred by two suspensions to the most outstanding players recently, Fagundez and Tremoulinas. 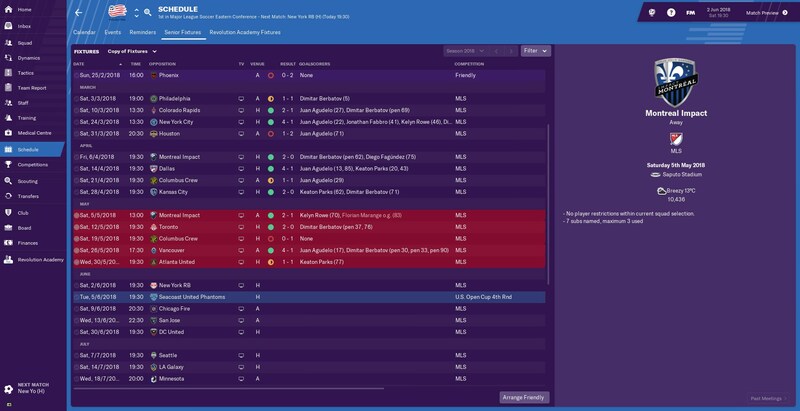 This inevitably hurt us in the 2nd leg, but as we got to a 1-0 lead, everything seemed safe until they got a goal to make it 3-1 on aggregate. Then in the 89th minute they scored a goal to not only win the 2nd leg but put themselves 1 goal behind us on aggregate and who knows, they could've scored in stoppage time. Since we won 3-2 on aggregrate against the Canadian side, that means we put ourselves in the MLS Cup final which is going to be our last match. 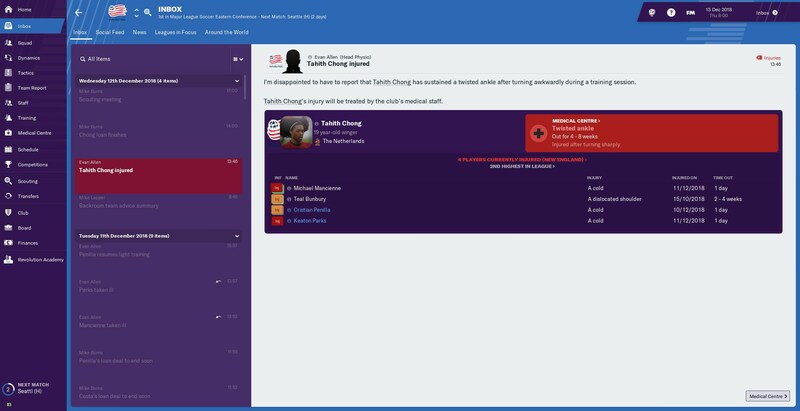 Unfortunately, we suffer an injury to Tahith Chong as he hurts his ankle which pretty much rules him out for the rest of the season as we only have 1 game left which meant Manchester United recalled him. We also suffer an injury to Caldwell, so pretty much we don't have any backup midfielders that are good for the final so we've got to hope no one gets injured in the MLS Cup final. 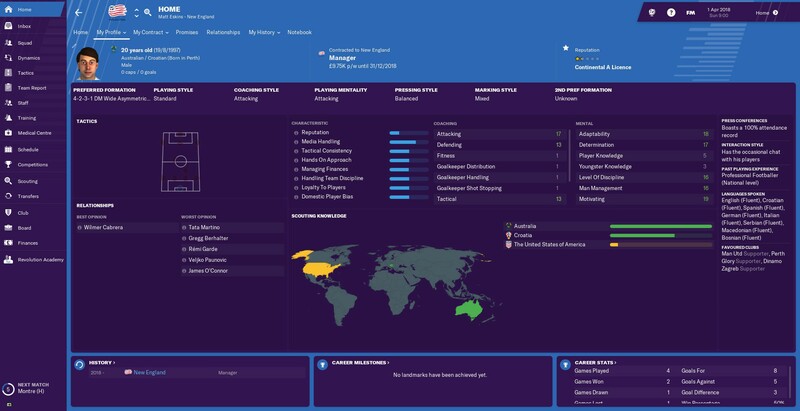 Here is my manager's profile with his bleached hair which will hopefully bring him good luck. I've gotten through the Club World Cup and we ended out winning it which will add an extra 10 projected points! We haven't had the greatest of month and there were results that should've been better, but we're definitely improving and it's taking a bit of time to find the right tactic as the players are naked from the tough schedule recently. 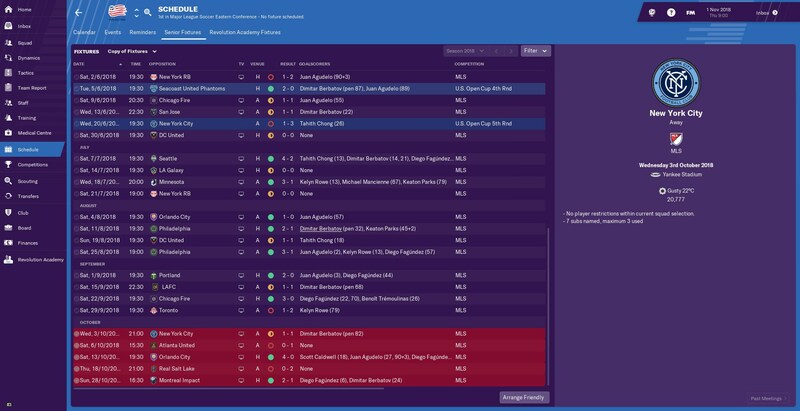 We started off the month by drawing with Leganes and then beating Bilbao after that. 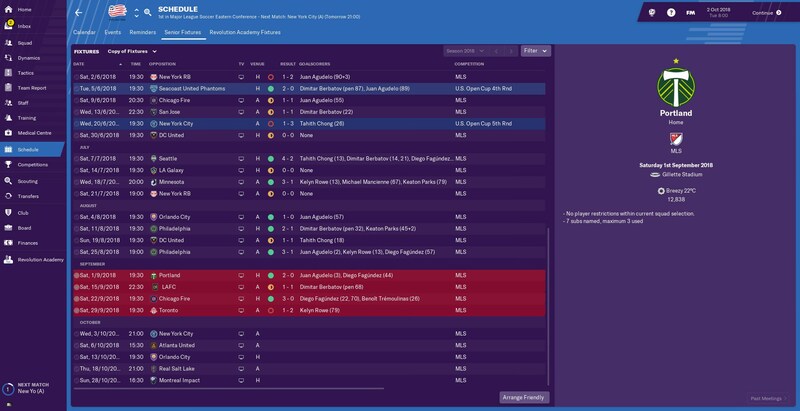 Now we have our 2nd leg in the Copa del Ray which we proceed to win but we fail to back up that performance with a 2-0 loss to Valladolid. The next few games end in a win against Villareal and Girona while a draw is good enough in the Copa del Ray quarterfinal 2nd leg. To end off the month, we record a nice 1-0 victory over Celta Vigo and hold onto a 1-1 draw with Eibar in the Copa del Ray semi final. 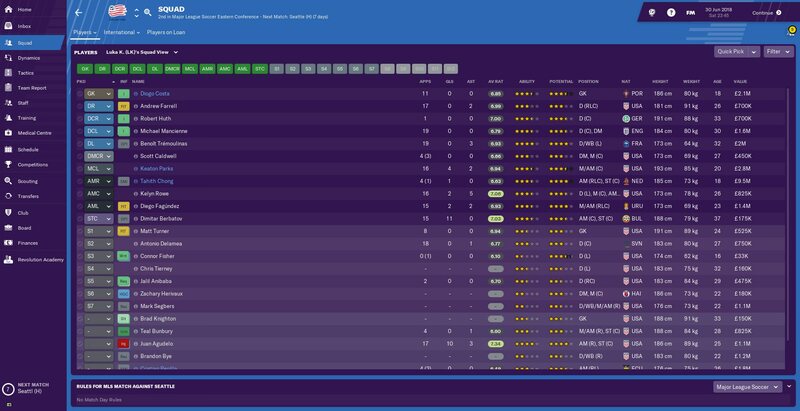 An improvement from last but we're still stuck in relegation zone but it will be soon before long until we get out of relegation. February ended out being another month of experimenting but I think we're at a stage of finding a great new tactic. 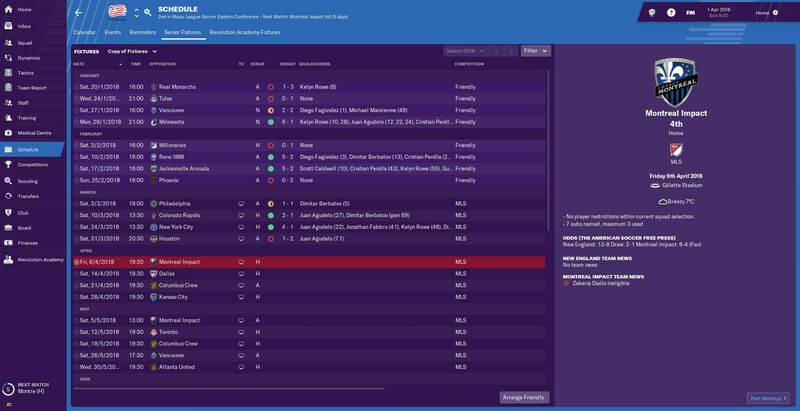 We started off pretty well with 2 wins as we advance to the Copa del Ray final and although we did draw with Rayo Vallecano, we did beat Fenerbahce and found what seemed a great tactic when we were losing to Atleti which helped us make the comeback. 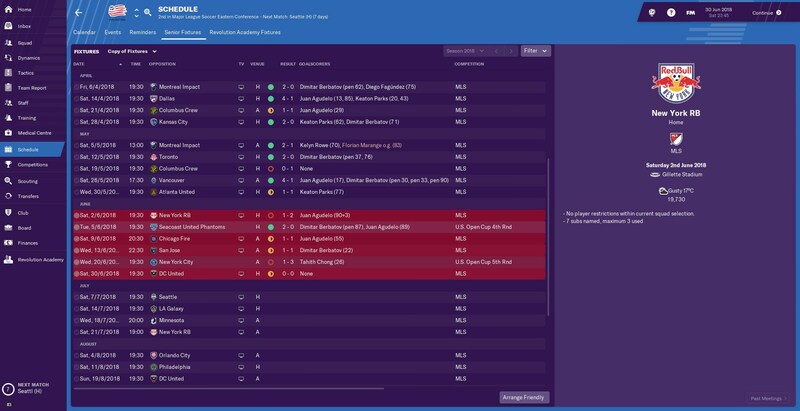 Unfortunately, it was a false alarm as we ended out losing to Barcelona and barely getting the win against Espanyol and then losing again to Valencia. Despite the experimenting, we are already out of relegation zone and heading for the top half. 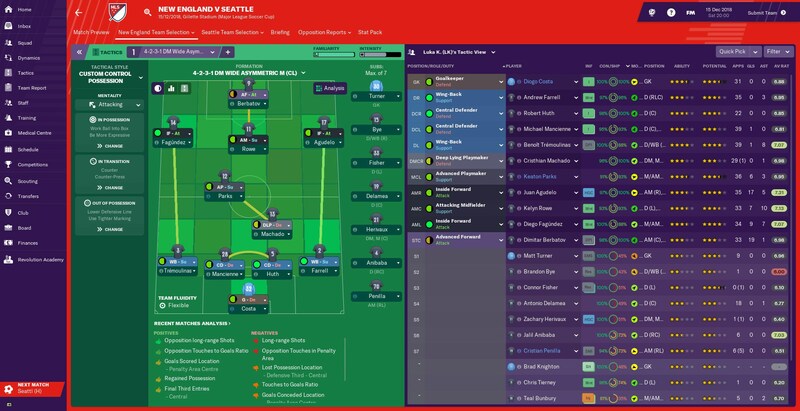 A great month for revival as we've finally found the perfect tactic that suits our team and it ended out being a narrow formation, the only one that generally works for me at most teams. It started off good with a 3-1, 2-1 and 2-0 wins against Getafe, Fenerbahce and Leganes, respectively. 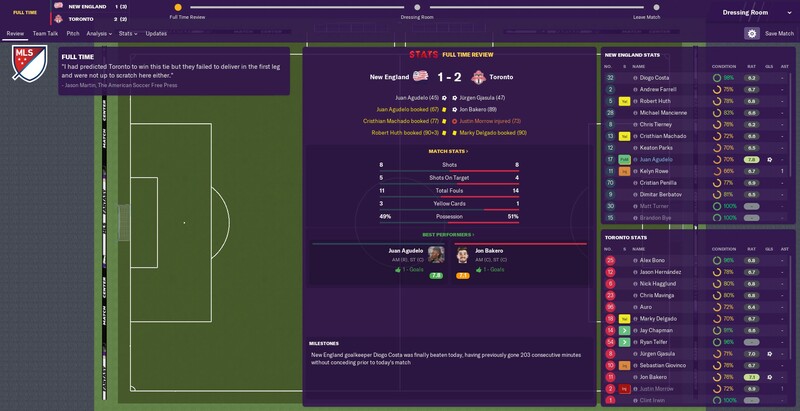 It got even better than that as the players got used to the tactic as we smashed Real Sociedad 5-1 while we kept clean sheets in our double 2-0 wins over Alaves and Eibar. 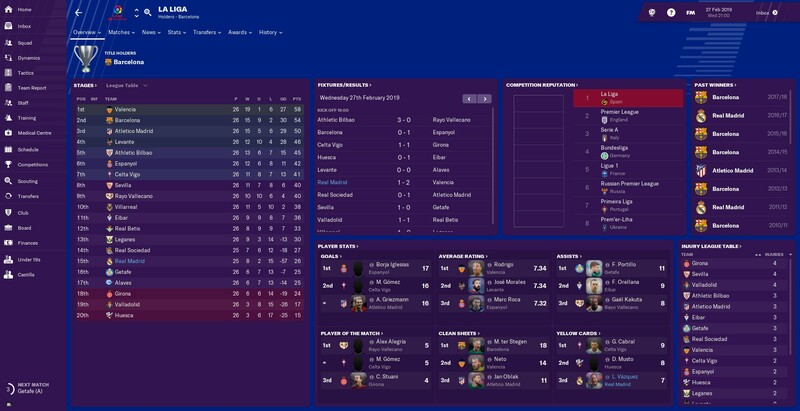 Following a month filled with wins, we now sit 12th in the table and only 12 points off the top 4 while Mariano is catching up to win the Golden Boot after impressive months since I've taken over in charge. A good month here as it is filled with wins, especially 3-1 ones and we managed to advance to the Champions League semi-final which is good for our points total. 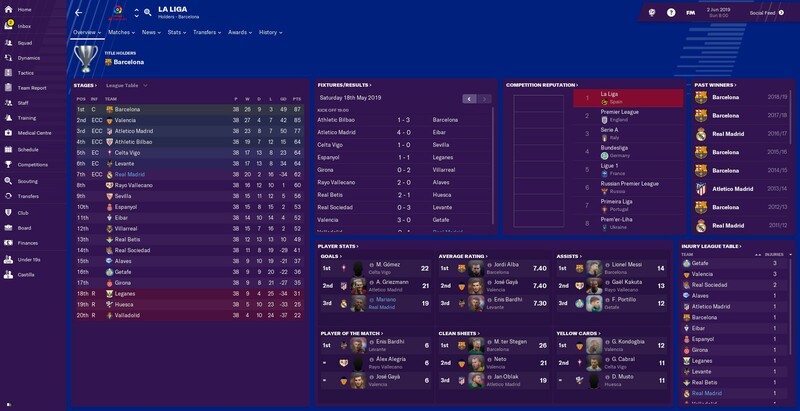 It's our last month here as we recover from a 1-0 deficit to advance to the Champions League final as we win all our La Liga matches to make up ground. 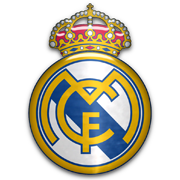 Most importantly, we win two trophies in the Copa del Ray in which we beat Atletico Madrid and the UEFA Champions League, for the 4th year in a row! We've now managed to sneak in a Europa League spot after being last in the league half way through the season! It's a shame that we were 2 points off finishing 4th which would have undoubtedly got us more points but I'm satisfied with how stop 2 has gone so far. Unfortunately, Mariano wasn't able to win the Golden Boot which was a bummer but I have learnt a few things from this save. One of them is that Mariano is definitely a good striker hence why he got called up for Spain in the game recently following his wonderful performances that saved us from a downfall. Another thing I've learnt is that Nacho is actually a pretty good full-back as he's played very well for us and given Marcelo a rest when needed to and he can also operate on the other side, so definitely a good cheap signing that would be useful in other saves or even here in the Susie On Tour challenge.